First, people were dropping cable TV. Now, they are dropping home internet service. I stand by my crazy suggestions to keep customers. 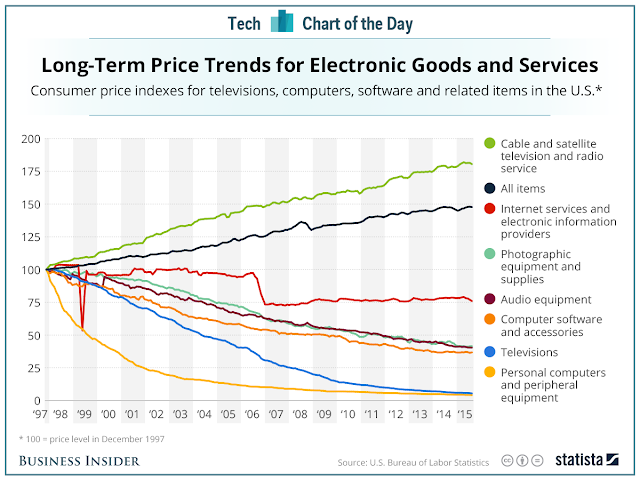 The trend is for tech to get cheaper over time... with the exception of your cable bill. I've been thinking about cutting the cable cord and going a la carte - $40 gets me lots of channels including ESPN(s), SEC Network, and HBO. I should probably pick up an ARRIS SURFboard SB6183 DOCSIS 3.0 Cable Modem and quit renting, too. "The fee, which was previously assessed at $5 per year, added $25 to the total cost of a GMRS license, which has a term of five years. While it does not eliminate the cost of a license altogether, the complete elimination of the regulatory fee brings the total cost of a General Mobile Radio Service license from $90 down to $65." Because the promise of a paperless society* has not materialized... we need to change our default fonts to save millions. I already use 6 pt fonts to save disk space. * And where are my jet packs and flying cars?!?! In the US, $707. In Brazil, about $1,200. My company looked at doing business in Brazil. I learned about several complexities on the accounting side. I suspect these "complexities" explain the extra $500. Very interesting... I'm not quite sure what to make of it, but the US does not appear to be making a reasonable return on its investment in healthcare. Google's Next Acquisition: Skydrop - the Nest of irrigation systems. Time for someone to create an open-source controller! I've bought my share of inexpensive electronics. If I need some cables, adapters, or other miscellaneous small electronics and I am wanting to save money, but avoid some risk, I usually check two places. Monoprice (Coupon "xmasinjuly" good for 5% off today and tomorrow.) - I've bought a ton of network patch cables from them along with other cables. Amazon Basics - These are Amazon store brand electronics. I've had bad luck with iPhone chargers and the like from overseas. Amazon's stuff is higher quality without paying a premium. "Current climate "good deal" threshold (red text) = 60 cents per round"
Current climate being key there. In an effort to make training more accessible in these times of increased prices and reduced availability, Magpul Dynamics has updated their pricing structure, round counts, and acceptable calibers for the 2013 training year. Effective immediately, all three-day classes are reduced to $600 per student, and two-day classes are reduced to $450 per student. In addition, the curriculum has been revised for all pistol/carbine courses based on the changes occurring over the past year to allow for maximum training value at a slightly reduced round count. Also, we are temporarily allowing the use of pistol-caliber carbines and 22LR AR-15 pattern training rifles in the carbine classes. Please understand that there are many drawbacks to training with 22LR as opposed to normal rifle platforms, but significant training value will still exist. We expect a full return to allowing rifle-caliber rounds only in the future as the ammunition supply catches up with current demand and ammunition prices return to a reasonable level. However, we understand the financial burden placed on students with the current state of the economy and the rapid rise in retail pricing in the ammunition industry. We firmly believe in the value of quality firearms training and are committed to providing quality products and services at a fair price. It is nice to see that people get it - and I bet it helps their business. They (deservedly) look good and probably get a few customers they wouldn't have before the changes. I believe in letting the markets work, so the prices are what the prices are for rifles, pistols, and ammunition. If you don't like the price, let it go. If others do the same, the prices will come back down. Heck, if the Constitution isn't totally torn up, there might even be some deals to be had when things normalize. I'm a month and a half late on this, but it is still hard to believe that you can get a DVD player for $50 bucks compared to where we were. The Chinese continue to crank out the inexpensive electronics. In this case, it is not a radio, but a monitor - the Crossover 27Q. It is said to use the same LCD panel as the Apple Thunderbolt Display. Yet another opportunity to save a lot of money if you are willing to take a risk. "When I went to college, you were expected to graduate in four years. For today’s college students, this expectation has somehow gotten off-track. We have embarked on an all-out effort to make on-time graduation the new norm for our students. Starting in the fall of 2013, our full-time undergraduates will be charged for 15 credit hours per semester—the number they must take to graduate in four years. They now pay for only 12 credit hours, regardless of how many they take. " "This new plan will be a money-saver for students and their families. Adding just one year of college costs an extra $24,000." Look how much we are saving you! Ignore that tuition is going up! Sounds like spin to me. And I took 21 hours a semester on occasion, so it is safe to say that I'm okay with people taking more than 12 hours. Keep your priorities straight, man: I can order bottled water from the internet, but I can't get books out of my faucet." Last year I posted about the end of paper Social Security statements and lamented that there was no on-line replacement. That's changed. You can check your Social Security history here. "if any rep from baofeng monitors this site is'nt it about time you got these radio's right.after the uv-3r mk-1 then the mk-2 and the mk-3 and now the uv-5r there are still major issues.come on get it right and stop ripping your customers off and coming out with useless excuses." I'm not sure why this bothers me so much. The outrage? The grammar? The lack of specifics (relating to the "useless excuses"? The incorrect model names? The sense of entitlement? The sense of powerlessness? No one is making this person buy these radios. Most reasonable people understand that, in the real world, there are trade-offs. Pay less, get less. He can't be bothered to use capitalization or do any proof-reading for a few sentences, but someone else better darn well make a perfect product and make it super cheap. I did not reply on the board as I generally prefer to avoid feeding the trolls. Since logic does not appear to be his strong suit, trying to persuade him with more logic is likely to fail. I'm a geek, but maybe I am a frugal geek, because my utilities are much more expensive than my monthly technology cost unlike the findings in this article. If you don't like words, there is a good infograph there, too. Another factor is that my house is one big energy sink when it comes to heating and cooling. My base usage is a small number compared to the heating and cooling costs. I need a smaller house. This article/cartoon pokes fun at our reluctance to pay a dollar for an app when we routinely buy $5 coffees, $200 phones, etc. It struck a cord with me as I buy very few apps - most apps that we have bought have been for our three year old. I think the reason I avoid buying apps is that I don't think I will use them over the long haul. Of course, I drink my Starbucks all in one sitting, too.